I take this opportunity to address you tonight on matters of national importance. It has been over five months since the last address. We have deliberately waited on this occasion to do so when we have some major national announcements to make. In the interim we have adequately kept you abreast with the dealings of the government through our weekly post cabinet briefings. We have also continued to be directly in touch with the people; and earlier this year we concluded another very successful round of constituency consultations. We are committed to resuming those as well in the New Year. But before I delve into the other areas of governance, I want to take this opportunity to pay public tribute to our brother and friend — Senator Jester Emmons who passed away last week. We mourn with his wife and daughter, and his parents, as well as the people of Carriacou and Petite Martinique, his passing. These last few days have been particularly difficult for all of us who have come to know him well. But it has been even tougher for his immediate family, especially his wife and daughter. Brother Emmons was a bright spark, whose light shone among us. As people of faith, we have no doubt that this good and faithful servant of both the Lord and the people of Grenada, Carriacou and Petite Martinique will be justly rewarded. We are in the process of consulting with his family about funeral arrangements; and in the coming days we will be in a position to share with you those details. We are committed to giving him a fitting farewell. We assure his wife and daughter that they will not be alone, and we will do everything in our power to ensure their growth and stability as a family. We have no doubt that brother Jester will want us to push on in the service of the people. And even with a heavy heart, we are doing so. As we get ready to wrap up a year that has been filled with challenges and successes, we look forward with anticipation and expectation as we enter the midterm next year. The budget, which I will present on Wednesday November 26th, will outline in detail, our plans and programmes for the coming period, as we continue our quest to lift more people out of poverty and to deepen the people’s empowerment. Sisters and brothers, let me be very clear: We have faced the economic challenges that we inherited head-on. Having taken the tough decision to lay a proper economic foundation for long-term growth and sustainability, we are satisfied with the early results. So too are our development partners. We have so far met all the major targets under the Home-grown Structural Adjustment Programme. We have sown the seeds for success. In the coming months we are determined to build on these successes. And just as 2014 was a marginally better year for most Grenadians than the previous year; we expect even further growth next year. We are eager for the people to begin to benefit from the fruits of their sacrifices. But, we are under no illusion that this will be an easy ride. There will be bumps along the way and we will have to navigate potholes that the world economic system may conjure from time to time. The issues of climate change and terrorism pose on-going challenges of their own. And, as we have been reminded this year by issues related Chikungunya and Ebola viruses — a world health emergency can, out of the blue, have devastating economic consequences. As long as we manage the things we control well, then the economy in particular, and Grenadian life in general, will be in better shape to withstand whatever external shocks that might arise. That’s why we understand that the our long term viability lies in our ability to grow the economy — through investments and expanding commerce; and through efficiencies that will reduce the cost of business and give us greater results, faster. We have to embrace new technologies, more willingly and more quickly; and we have to raise our productivity. People entrusted to manage various departments in the public sector must do so more efficiently. Each one of us must demand more of ourselves. Indeed the requirement of the time is for all of us to lift our game. As a government, we will not bemoan the challenges of our era. Instead, we remain excited about the possibilities. We live with the belief that every crisis is an opportunity for us to find a solution. The world has been hit with such a crisis with the outbreak of the Ebola disease, primarily in West Africa. The outbreak of this particularly deadly disease has put the whole world on notice. While the chance of an outbreak here may seem very remote; we are not about to take any chances. Let it be understood, that even in a time of adjustment, my government will leave no stone unturned to ensure the health of our people. There is no greater investment; and there is no task more urgent. And we must all be up to it. This is not time for political divides. The challenges of this deadly disease require unity of effort. The outbreak of chikugunya should have taught us many lessons. One of those lessons should have been the importance of having a sense of community that must be built on the basis that we are one Grenadian family. We should have been reminded that there are issues in development; and there are shared challenges that we will face, which must not been seen through political lenses. As we know, the chikunguyna outbreak affected every aspect of Grenadian life — and yet sadly a small section of the population had sought to make cheap political mileage of people’s pain and suffering. There is a small segment of the society that criticises without offering solutions— but they are increasingly out of step with the new Grenadian reality of solidarity and co-operation. We have long advocated a coming together of our people under what we have called Project Grenada. Joining Project Grenada does not require anyone giving up their party cards or abandoning their affiliations. It must be fuelled by our sense of patriotism, and of commitment to our families and our brothers and sisters as well as our children and grand children. That is why we continue to hope for bipartisanship on many levels. We have enough faith in the Grenadian political conscience to believe that we can find common ground on the things that threaten our very survival — like the environment, the issue of health, our children’s education; the tackling of the housing problem and unemployment; and of putting an end to the era of high debt and low growth — that if left unchecked, will drag the Grenadian society into an unenviable new era of dependence. Fortunately for us — most Grenadians — and the leaders of most Grenadian organizations, have understood this urgency. And so, we have been very encouraged by the work of the social partners. The leaders of the Churches, the NGOs, the trade unions and the organised business community have guided the way. We have been inspired by their commitment and their sense of patriotism. Their actions have spoken loudly to us politicians on both sides of the isle. These are different times which call for different leadership initiatives. And that’s why I have said from the very beginning of this new term that the change has to start with me and I have had to be a better leader. I know there are still doubters; but as I told my own supporters at a party general council recently, we are determined not to return to the days of spite and divisiveness, that has been a negative feature of all governments since our independence. The business of settling political scores has been closed down. This administration has successfully run it into the ground. Instead we are busily seeking to open new opportunities for our people — through attracting foreign direct investments — and through initiating a robust and progressive foreign policy; while at the same time adhering to fiscal discipline in government’s economic policy at home. And as we move along, we continue to take stock of what we are doing. We yearn for greater efficiency and better synergies; and for a public service configured to deliver better results faster. We continue to advocate; and we continue to push for change in that regard. Among our team — and among people who are willing to serve — we continue to also explore the best configurations for achieving our policy positions, while trying to stay true to the concept of a united development front for Project Grenada. As I said during the swearing in of ministers in February 2013, the ministerial appointments are not meant to be permanent — and that there may be need to adjust the configurations from time to time. Those adjustments will be made for a number of reasons — including giving members of our multi-talented team different experiences; to be sensitive to the twin demands of being an MP and a member of cabinet; and to seek to use skill sets and experiences in a way that will be most beneficial and fitting for the new challenges that we will confront at each stage. As we get ready for a new budgetary period and a new year; and as we move into our third year — we believe that this presents us with a unique opportunity to enact some change in the arrangement for the reasons just stated. And so we are moving with immediate effect to make changes to both the ministerial portfolios, as well as the configuration in the Senate. We have decided to give some of our new constituency representatives who have been cabinet members more opportunities to be able to consolidate their work as MPs, understanding that we are well into our five-year cycle. When we came into the office, we leaned heavily on our freshmen MPs — with their boundless enthusiasm and their youthful energies — to do a lot of the heavy lifting. In all of their areas they have done a remarkable job up to this point. The successes of the likes of Alvin Dabreo, Oliver Joseph, Nickolas Steele, Delma Thomas, Alexandra-Otway Noel and Emmalin Pierre — all in their first tenure as MPs — have taught all of us — especially the more experienced among us — what is possible. I am confident that we have begun to build a new cadre of politicians from which the next generation of leaders can emerge. We were very conscious from the very beginning of the role these young politicians have to play in party and governance. And the adjustments we are going to make will offer different spheres of responsibilities to help broaden their horizons for future leadership of this country. And we the older, more seasoned politicians must be ready and willing to provide advice and support. In the first year and nine months, we have put a heavier burden on some of the Ministers because of the very nature of their portfolios. They have hardly had time to build their profiles as constituency representatives, while in service to the nation in all parts of the world. Our Foreign Minister, Hon Steele has led the foreign affairs team from the very beginning. We have expanded our diplomatic connections in Latin America, the Gulf and the Far East, while keeping our traditionally strong ties with North America and Europe. But this has come at a cost to our Minister, who, from the time he assumed office, has been leading the charge in our new efforts to positively engage the world. Minister Steele however, in his own words, has stated that his most important job next to being a husband and father, is as the MP for the Town of St George. Minister Steele came into government with a successful history as a business manager, and we also want to take more advantage of that going forward — particularly in this current environment. In light of these considerations, I will be offering Minister Steele the new portfolio of Minister of Health. The Ministry of Foreign Affairs will therefore now be headed by Honourable Dr Clarice Modeste, one of the most experienced and seasoned MPs among us. Dr Modeste is into her fourth term as an MP — who through her plethora of experiences, has developed connections and a support structure in her constituency of St Mark’s that will allow her to undertake the dual role of Foreign Minister. Our foreign partners can rest assured that while the personalities may change, our foreign policy will remain the same — open and innovative. Minister Steele will have his hands full as the Minister of Health — and so the other part of his previous portfolio — International Business will now be undertaken by Minister Oliver Joseph. Minister Joseph is already Minister of Economic Development, and we believe that adding International Business to it is a more natural synergy. In the changes that will take effect, sister Alexandra Otway-Noel will be a full Minister in the Prime Minister’s office, with special responsibility for Implementation. Minister Otway-Noel will also be tapped to carry out special assignments for my office, while at the same time being able to learn first-hand from my experience. We have also given consideration of her wanting to be more available to directly oversee some of the extended work we will do in South St George in the coming period. Sister Alexandra Otway-Noel has capably and energetically shaped the Tourism and Civil Aviation industries in the last two years; and Pure Grenada has proven to be a worthwhile brand that is now attracting more visitors. Tourism is on the rise, with all the industry’s numbers heading in the right direction. We have a new governing authority and a new marketing approach. The foundation has been truly laid for even more growth and development in the future. And now that she has done the heavy lifting, it makes it relatively easier for someone else to take up the mantle. We are grateful to Sister Otway-Noel for a job well done, as we welcome Yolande Bain-Horsford to the Ministry of Tourism and Civil Aviation. Sister Yolande has been patient and continued to be a valuable team player even when she was left out of the cabinet last year. Her introduction now is in keeping with the promise to give members of the team different opportunities from time to time. We have confidence in Sister Yolande’s ability to continue to guide the upper trajectory of the tourism industry. Continuity and development are also assured because of the team Minister Otway-Noel has put together in the Authority — which will continue to manage the industry in a direct way on a day-to-day basis. Under the adjustments in portfolios — the National Lottery Authority will now come under the Ministry of Culture headed by Senator Brenda Hood. Minister Emmalin, our Minister of Youth, Sports and Religious Affairs, had herself requested that she be relieved of responsibility for the national lottery. We were more than pleased to accommodate her request. The National Lottery, as it so ably has done, will continue to play its part in the support of sports and culture. We are also pleased to announce that we are making changes in the configuration of the Senate. The decision on the changes was made before the untimely passing of brother Emmons. No replacement will be named for brother Emmons at this time. Out of respect, we believe that it is only fitting to continue to mourn him, and give him a fitting farewell before we address the matter. Among the changes we will be making in the senate is the replacement of the retiring President Dr the Hon. Lawrence Joseph. A long serving member of parliament, we will be fortunate however not to lose his experience and wisdom altogether. Dr Joseph has agreed to be an advisor to the parliament and the members of our cabinet. Dr Joseph will continue to serve as Deputy to the Governor General. We look forward to his continued wise counsel. Also leaving the senate will be our party Vice Chairman brother Kenny Lalsingh, who since 1984 has served as MP, Minister and Senator on various occasions. 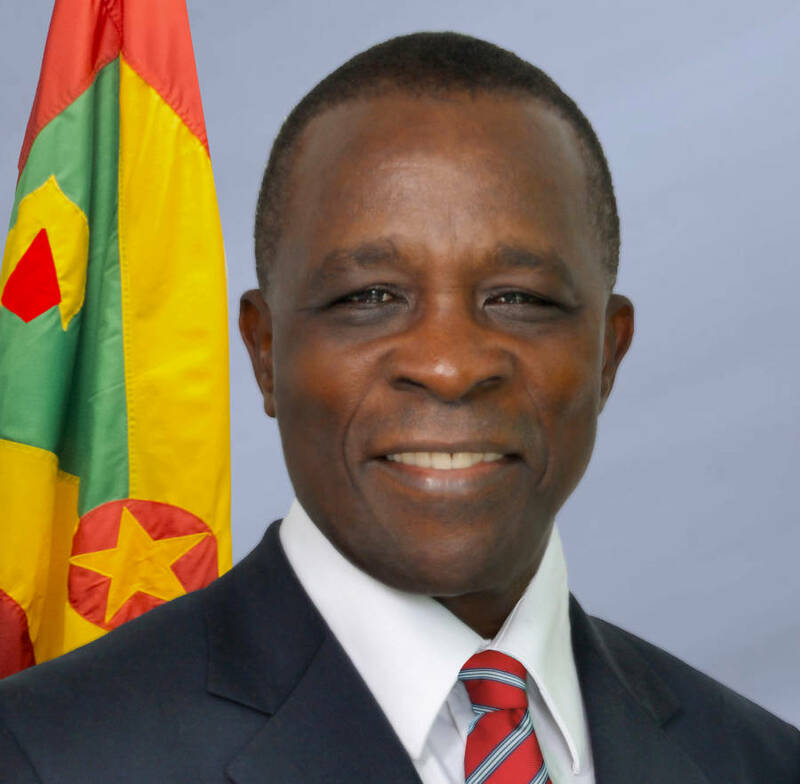 Brother Lalsingh will continue to serve as the Party Vice Chairman, and has offered to continue to be of service to the government and people of Grenada through special assignments, even while he takes the time to pursue other interests. As a consequence, Hon Simon Steill will be elevated to Leader of Government Business in the Senate, spearheading the government’s work in this new legislative period. Senator Steill has a solid team to work with — new and vibrant senators such as Sheldon Scott and Winston Garraway — as well as more experienced veterans. That team will be joined by brother Peter David, who we are happy and proud to welcome into the fold of the Senate. Peter David is an experienced politician, having served two terms as MP and as a very successful foreign minister. In recent months, he has also been a very useful new member of our party, and he has shown the ability to help government articulate its objectives and its policies going forward. The other new member of the Senate will be brother Chester Humphrey — our most experienced senator since independence. Mr. Humphrey served for over 20 years as the labour representative in the senate, and has acted as President on previous occasions. He knows the workings of the body as good as anyone. The appointment of brother Humphrey is consistent to a long held policy of this government that one does not have to be a member of our party to be given such a position. We had set that precedent a few years ago when we had nominated Leslie-Ann Seon to that post. More importantly, the addition of both Mr David and Mr Humphrey in the Senate, shows our commitment not only to talk the talk, but walk the walk of inclusion. Our shared history as political combatants is well known. Now we share the reality that there are redemptive qualities in Grenadian politics, if we are to ever fulfil our mandate of people first politics. It was instructive that the homily at my church service on Sunday was about unity and people working together. We are indeed committed to that unity more than ever. Tonight is not meant to be a moment in time that is frozen in the politics of this country. Instead, it is a developing journey that is steeped in what is in the best interest of the Grenadian populace. We have dropped the baggage of the past; and our forward movement is fuelled by hope and an understanding that tomorrow will be better than yesterday. And so, we march forward, holding out a hand to everyone who will join us on this path. It is our profound hope that what we do in this time, will inspire the next generation of leaders; because we understand that our country and the people we serve transcend all of us; and deserve all of our best efforts. We ask for your collective prayers for the continued success of your government. I thank you very much, and good night.